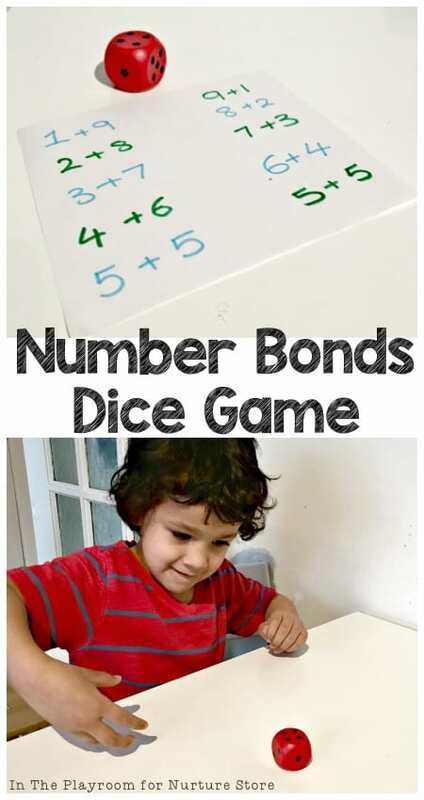 This dice game to help children learn number bonds to ten is so simple to set up and builds really important basic math skills that will help your child with their mental math. The idea is from Anna of In The Playroom, who joins us today as part of our ABCs and 123s letter and math activities series. Learning the number bonds to ten can really help children with their mental maths skills, and help them to understand how numbers relate to each other. This activity is a super simple way to get some practice with number bonds in a fun and hands on way. This game only requires one item and does not need any set up time, so you can easily fit it in when you have a few spare minutes in the day. 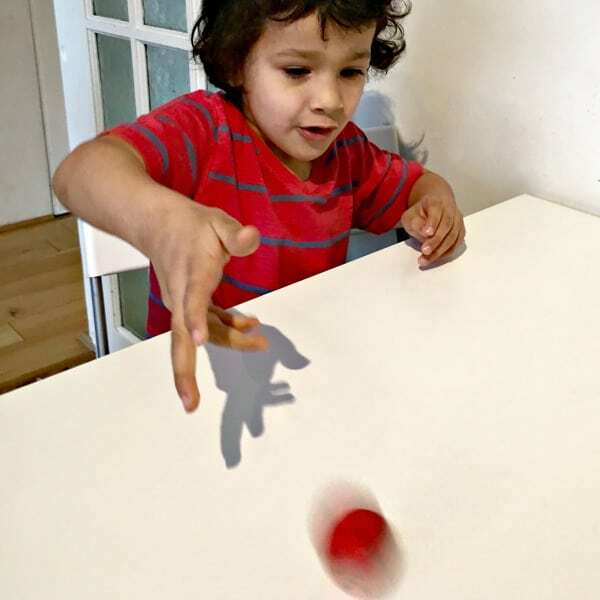 All you need for this activity is a dice. Larger wooden dice are often better for games like these, and if you have a really big foam dice you could take this outside in the summer and combine this idea with active play. You might also find it useful to make up a chart with the number bonds written on paper, depending how confident your child is with their number bonds. If they’re still consolidating their knowledge on this, it can help to have a chart to refer to when they get stuck. Later, when they’re more confident then remove any charts. Each player takes turns to roll the dice and then shouts out the number needed to complete the number bond. For example, if you rolled 4 then you will call out 4+6. If the next person rolls a 5 then they will shout out 5+5 and so on. Watch the video for a fantastic demonstration! 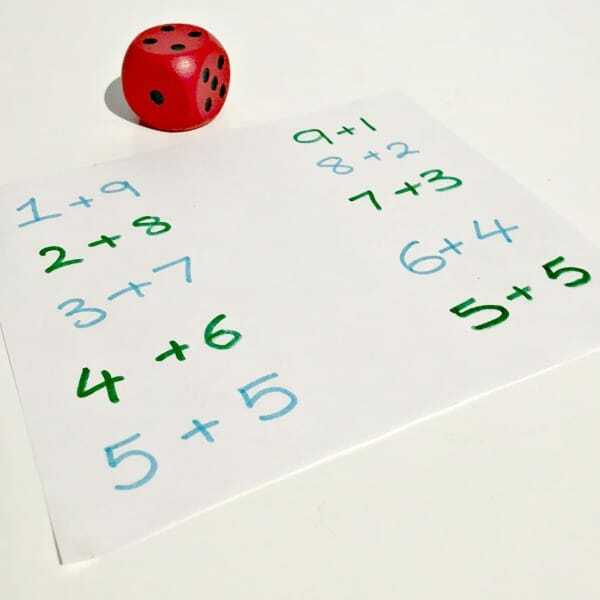 If your child has any number bond rhymes that they’ve learned at school or at home, you could incorporate these into the game, and get them to shout out the rhyme for each number bond fact when they roll the dice. You could also get them to call out the inverse of the number bond, since a typical dice only goes up to 6. So if they roll a 1, then ask them to call out both 1+9 and 9+1. You can buy 10 sided dice, although they are not as commonly found as 6 sided, but if you’re able to get a 10 sided dice you could also try playing using that as it will be perfect for this activity. If you have two ten sided dice, then you can play roll the number bond where each person takes turns to roll the dice, and if they roll any pair of numbers that add up to ten, then they will get a point. Race each other to see who can score 5 points first. Here at In The Playroom we’ve also enjoyed making Duplo number lines, Exploring Symmetry with Wooden Building Blocks and Building 2D & 3D Shapes with Craft Sticks. I’m Anna, a mum of three boys aged from 4 to 7. I enjoy sharing creative and educational activities and would love for you to visit our site In The Playroom for more fun and simple ideas. Just found your blog, I was trying to find some helpful ways to teach my daughter number bonds as we’ve just reached it in her workbook. Your post has been really helpful, and I’m gonna try with the blocks or something similar tomorrow, I think it will help her alot more to understand the concept, as she has struggled a little bit with it. Thankyou. Hi Kizifan. I’m so happy to hear this was useful to you. I hope you both have a fun and interesting time learning with your blocks.